What a great week on big wahoo we are having fishing in Fort Lauderale this week. Big wahoos, 30-40 pounders are biting really good anywhere from 100-600ft of water. Today, Capt Adam went trolling out in 400 ft of water looking for wahoo. They hooked into a double header wahoo, both of which took a crazy run right off the bat and almost stripped the reel. We had to back the boat down to make sure we didn’t run out of line. The wahoo took such a fast run of line off the reel right off the bat that both reels actually smoked. When both fish stopped their initial run, it wasn’t too hard to fight them in. We gaffed the first wahoo, which was a 40 pounder easy. The second wahoo pulled the hooks right behind the boat. It was equally as large as the first one. We’ve also done good on the reefs trolling for wahoos. Capt Kevin caught 4 out of 5 wahoos trolling the reef yesterday, along with some sushi-sized blackfin tunas and kingfish. The reef wahoos aren’t as big as the offshore wahoo are this time of year. Some bigger mahi-mahi dolphin are being reported offshore as well. On the reef, sailfish continue to be active. 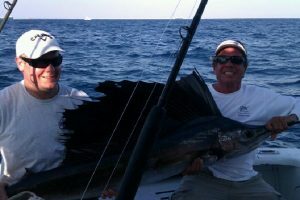 January and February are 2 of the best months for sailfishing in Fort Lauderdale of the whole year. We are finally getting some slightly cooler weather down here which is getting the sailfish active. Shark season is just around the corner with some mako sharks, hammerhead sharks and thresher sharks just starting to show up. 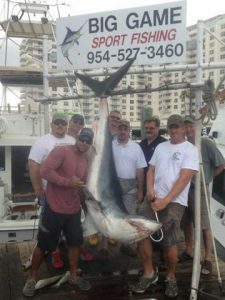 Get ready for the best big game shark fishing season of the year to begin next month. Good luck fishing out there this week everyone. Tight lines and good fishing! A lot of great fish are moving through Ft Lauderdale right now. Sailfish, Sharks, Amberjacks, Mahi-Mahi, Tuna, Wahoo, Grouper and More. 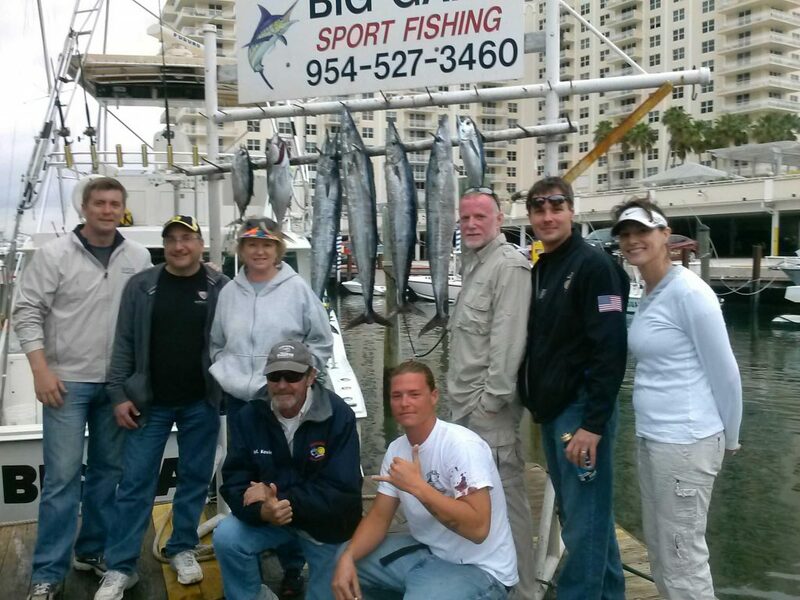 As we come into the Spring fishing season, fishing really lights up for us in Ft Lauderdale. The best bite this week has been Sailfish. Sailfishing in Fort Lauderdale this week is phenomenal. Every trip has either caught one or more sailfish, or at least had one or more on the line. 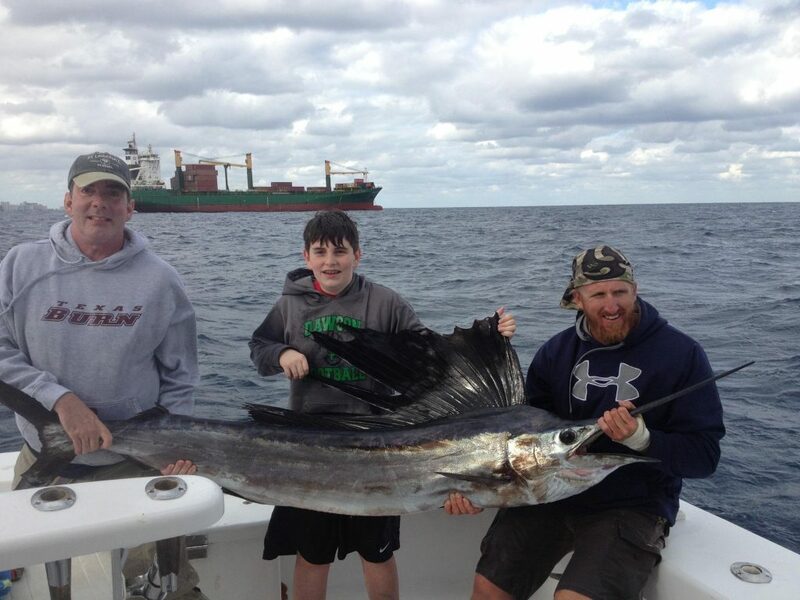 Sailfish are never a sure thing, but they sure are biting like it. Mahi-mahi schools are also inhabiting the reefs. We’re trolling out to and in from fishing grounds and hitting schools of mahi-mahi. Some of them are very nice size in the 20 pound plus class. March is a great month for the larger mahi-mahi, as is April. Sharks are here and they are biting with a vengence. Hammerheads are leading the shark train, big female hammerheads in the 6-10 ft range. We’ve caught a couple hammerheads this week over 300 pounds. Shark fishing season is just beginning and it’s starting off splendidly. 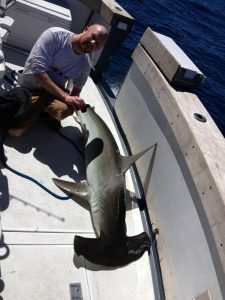 Some dusky sharks, black tips and sand bar sharks are also coming through our waters… we’re catching a few of them too. 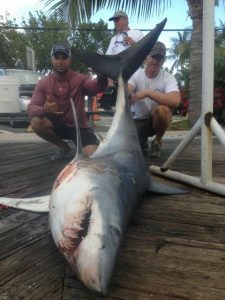 There have already been a few exotic sharks such as mako and thresh sharks seen this week, which is a good sign that the shark concentration in Ft Lauderdale is increasing. 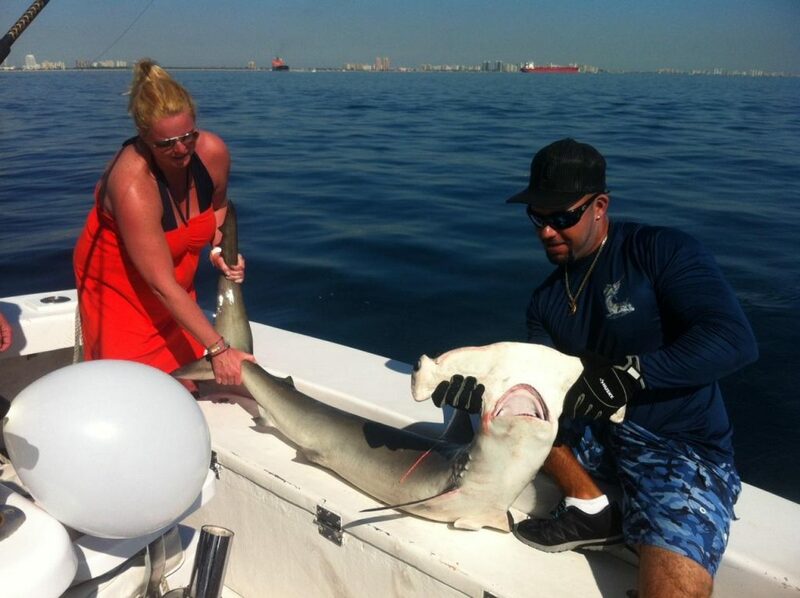 For the next few months, big game shark fishing will be a daily thing in Ft Lauderdale. Decent action on the wrecks this week too. Some big cobia schools are showing up on some of the better wrecks that we fish. Also some of the deep water groupers are biting. Jack fish are moving onto these artificial reefs and wrecks too and they will soon dominate the wrecks with their numbers. 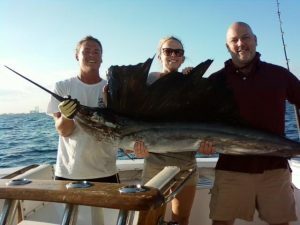 We’re getting into Ft Lauderdale’s best fishing season and big game fish are starting to snap. Good Luck fishing this month everyone. 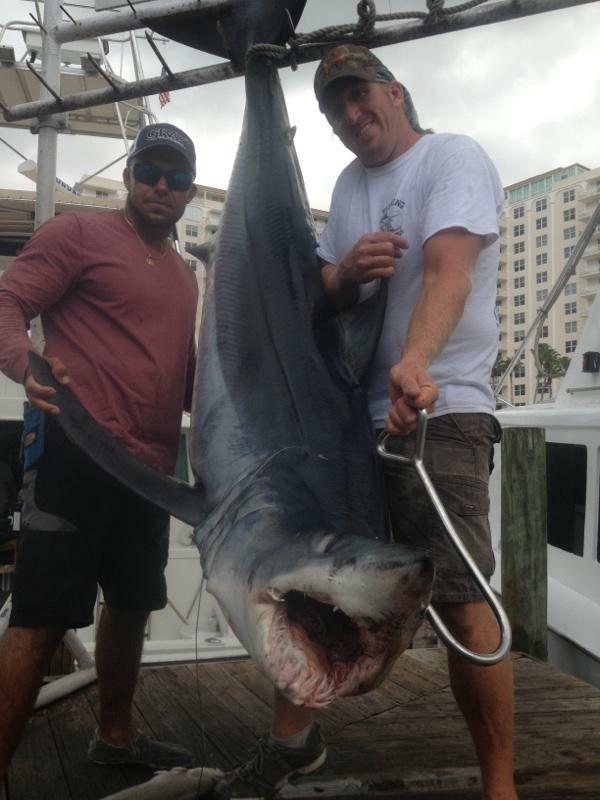 A 300 pound mako shark was caught today on a shark fishing charter. We set up in 350ft of water with a bottom, mid-depth and surface shark bait set. We were fishing for about an hour with no action, when suddenly a giant mako shark jumps 10 feet in the air about 50 feet from the back of the boat. The mako had eaten the middle bait, and the instead of diving deep with the bait, he had attacked it and swam straight up to the surface. The balloon, which acts as a bobber to keep the bait set at the specific depth, never moved. Capt Adam was on the wheel and he immediately threw the boat in full forward and yelled at the angler to reel on it hard and fast, trying to get the slack out of the line as quickly as possible. As soon as we came back tight on the fish, he dove deep. We knew it was a mako we were hooked up to and we were excited. This was the first mako we’ve caught in over a year at least, and we’ve only seen 1 or 2 caught among the entire fleet this shark fishing season. Mako’s are a cold water shark, mainly inhabiting the Northeast Atlantic. They are actually quite common to catch in New England, but for us in South Florida they are rare. After an hour long fight we got the fish to within 50 ft of the surface. Makos are one of the only sharks that jump high out of the water, one of their exciting attributes. On the bite, this fish jumped at least 10 feet in the air, but he never jumped again the entire fight. We were excited about catching this mako, so we were ready when the fish came up. Adam came down from the flybridge and grabbed the harpoon. He stood up on the covering board, took aim for brief second and threw. Perfect shot right through upper right shoulder. You can see the cord from the dart still sticking out of the fish. Big game sharks are making their way northward along the Fort Lauderdale coastline. This is a migratory event that happens every year around this time and it lasts for the next couple months, through June. This week, many hammerhead sharks were caught on our fishing charters. Hammerheads are the most abundant sharks that we catch, followed by the dusky and sand bar sharks. We also get some exotic shark species this time of year, such as the mako, big-eyed thresher shark, regular (small eyed) thresher shark, tiger sharks and even the elusive Great White Shark. This time of year when you’re shark fishing, you never know what you may catch. 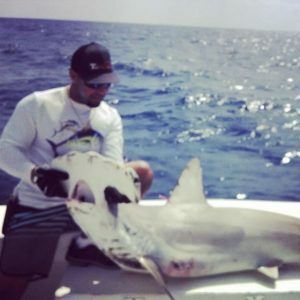 Shark fishing charters are extremely popular for us this time of year. They are the biggest and strongest fish in the ocean, with no natural predators. 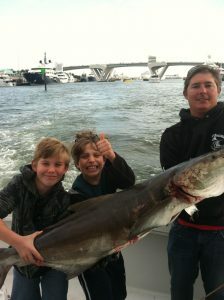 We specialize in shark fishing charters so we really excel this time of the year. Most of the sharks that we target concentrate in 300-400ft of water, conveniently just a mile off our coast. This is the edge of the Gulfstream where the cooler inshore waters meet the warmer waters of the Gulfstream current. The sharks swim right along that temperature gradient which is usually where the highest concentration of available food is. This is great for us because at the same as we are shark fishing, we can fish a few baits for sailfish, mahi-mahi and tuna which all inhabit the same territory. 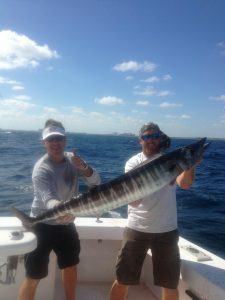 This is the season for big game fishing in Fort Lauderdale, and that’s what we specialize in at New Lattitude Sportfishing. Sharks, sailfish, marlin and swordfish are the main gamefish we go after, or anything else that is Big! If you want to catch the biggest fish of your life, come out fishing between now and the end of June. This is our season for giants, so give us a call and book a charter! We look forward to fishing with you. Sea you on the water. © 2019 New Lattitude Sportfishing. All Rights Reserved.